Wetzlar, Germany is to optics like La Chaux-de-Fonds is to Swiss watchmaking. In fact, with Leica’s focus on handcrafting and precision, it could almost be part of the watch industry itself. The population of Wetzlar, at about 50,000 residents, is slightly larger than La Chaux-de-Fonds’ 33,000 and it’s not a mountainous area, but rather split down the middle by the Lahn River. However, in both places, peace and quiet reign supreme. Aside from Leica, Wetzlar is also home to other prestigious optics companies, including Minox, Carl Zeiss and Leidolf. Small format photography as we know it today – also known as 35 mm – was born a century ago in Wetzlar, when Oskar Barnack made the very first Leitz camera. Barnack was an employee of the Leitz Werke in Wetzlar and, like Ernst Leitz, was a pioneer in field photography. A century later, Leica finds itself in a leading position in terms of luxury camera equipment. Celebrating this alpha dog position, it has created a massive factory building that is shaped from an aerial viewpoint like a lens. The main factory building housing more than 600 employees can well be considered a physical presence for “Made in Germany,” as the brand itself postulates. It is, indeed, impressive, modern and well thought-out in every aspect. 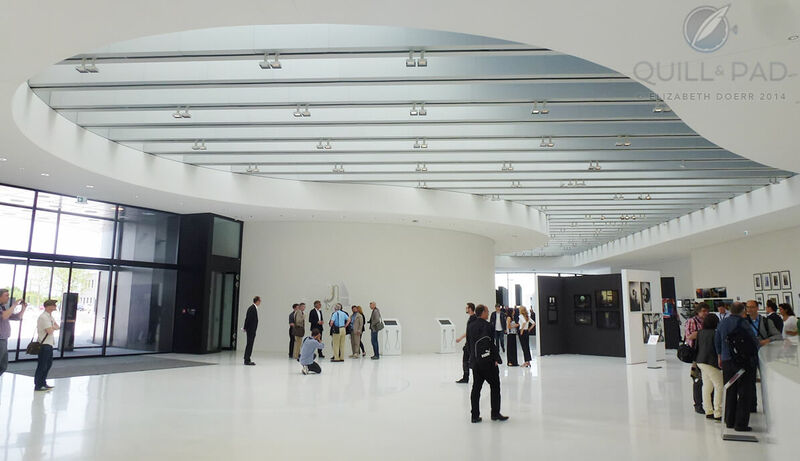 Like many other new factories in Germany – such as the refurbished Glashütte Original factory in Glashütte and Volkswagen’s “transparent” manufactory in Dresden – the new Leica building provides space for visitors to peek into production without disturbing the technicians. Through glass partitions, it was easy to see that the technicians work in clean rooms and flow boxes – like many watch factories do – so as to minimize dust and other particles landing inside the camera. Though much pre-assembly of “volume” and mechanical subgroups is done at Leica’s facility in Vila Nova de Famalicão, Portugal, adding all electronics and the final quality control is accomplished in Wetzlar under skilled workers’ watchful eyes and hands. The gallery space is set up in the spacious lobby area, and during the inauguration celebration it boasted two very special exhibitions. One called 10 x 10 displays photos that link the past with the future. Ten modern photographers engaged in creative dialogue with masters from Leica’s past to create a set of 100 interesting photographs. I particularly liked the collaboration between American street photographer Craig Semetko and black-and-white documentary photographer Elliot Erwitt, both of whom were on hand at the celebration in Wetzlar. The 85-year-old Erwitt is particularly known for capturing the “decisive moment” as coined by photographer Henri Cartier-Bresson. The exhibition entitled “36 aus 100” (“36 from 100”) puts together 36 of the most iconic photographs taken by Leica cameras from the last 100 years. This includes prominent photos just about everyone has seen such as the classic portrait of Che Guevara in his heyday. This is an installation currently planned to remain in place for a year. Then there is the Leica Macro Elmar M 90 mm f/4, a collapsible macro lens for the Leica M system. It is said to be perfect for use as a universal telephoto lens with additional macro capability. Finally, there is the new M Edition 100, which combines in one set a Leica M-A pure mechanical rangefinder camera for film photography with a digital Leica M Monochrom. And while this seems like a contradictory anachronism, in reality it’s not much different from a mechanical watch in its premise. Any lover of high-end watches will immediately understand the symbolism. Even more special, perhaps, is the fact that both of these cameras and their lenses are crafted in stainless steel, a first for Leica. They come in a specially made Rimowa case, and the set also includes Kodak TRI-X-400 black-and-white film for use in the Leica M-A. It is strictly limited to 101 sets for the world, and none of the items will be available individually. For more information, please visit www.leica-camera.com. And in case you missed it, please check out Leica’s Very Special Limited Edition EL 1 Chrono With Valbray to learn about the limited edition watch in honor of Leica’s centennial celebration. Ernst Leitz is to photography as Breguet, Lange & Patek are to watches. Alas… there is no finer glass! Great piece Beth. Try their Binocs. Nary a better way to swipe time!